Intercostal muscle strain is tear or rupture of intercostal muscles due to rapid movements that bend or twist the upper body suddenly resulting in sharp, stabbing pain during breathing or a persistent soreness or ache in the ribcage. The intercostal muscles are composed of several muscles known as the internal intercostals muscles, external intercostals muscles, subcostal muscles and the transverse thoracic muscles. 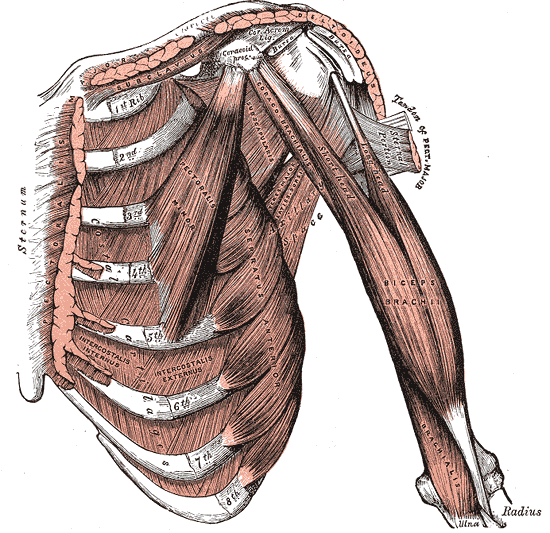 The primary function of the intercostals muscle is to allow the up and down movement of the chest muscle during inspiration and expiration in the process of breathing. It functions also in stabilizing and forming the chest walls. These muscles can become strained due to rapid movements that bend or twist the upper body suddenly. The disability and rate of recovery depends on the muscle strain grading, which indicates the degree of injury involved. Grade I consists of a mild muscle strain where only some muscle fibers are damaged. Healing time takes about two to three weeks. Grade II consists of a moderate muscle strain where more muscle fibers are involved, but muscles are not ruptured. Healing time takes three to six weeks. Grade III involves severe injury and complete rupture of the muscle. Surgical repair is required to heal the muscle. Healing may take up to three months. How does intercostal muscle strain occur? The injury commonly occurs after some vigorous activity that involves twisting of the torso – especially while lifting heavy objects or stretching the arms out excessively. This can occur in anyone, with vigorous coughing, sneezing or laughing, or with energetic repetitive movements involving rotation of the ribcage. When it comes to sport, these injuries can be triggered by inadequate warm-ups, poor technique or posture, or excessive training that results in fatigue. It is most commonly seen in fast bowlers in cricket, oarsmen in rowing, and throwers in athletics or ball sports. Symptoms commonly reported are either a sharp, stabbing pain when breathing to a ever-present, painful ache or soreness located around the ribcage. The pain is aggravated by deep breathing, side bending and twisting. Mild case of intercostal muscle strain may still allow the affected individual to continue with the daily activities. The pain felt is usually bearable that movement is still possible. The symptoms however may increase when resting or when the patient is cooling down. In severe cases of intercostal muscle strain, daily activity is often affected and the pain is usually debilitating. Athletes and other individuals with severe case of intercostal muscle strain usually have to refrain from engaging in sporting activities for some period of time or at least until the strain has recovered fully. Sporting activities such as rowing, bowling, running, jumping and throwing also increases the sensation of pain. A thorough subjective and objective examination from a physiotherapist is usually sufficient to diagnose an intercostal strain. Further investigations, such as X-rays are usually done to ensure that there is no fracture of the ribs, and MRI, CT Scan or ultrasound, are sometimes required to confirm diagnosis, rule out other conditions, determine the severity of injury and monitor healing. How to manage your intercostal strain ? Initial treatment for an intercostal strain must remain conservative at the onset to avoid aggravating the condition. Emphasis will be on rest, reducing the inflammation, load and stress on the affected area. Once the initial inflammation has been reduced, a program of stretching and strengthening will be initiated to restore flexibility to the joints and muscles involved, while improving strength and stability to the spine. Protection: Protect the muscle from greater injury by avoiding the activities that make it painful, such as twisting the torso. Rest: Avoid activities that involve heavier breathing. Splinting or bracing the affected area. Icing: Cold packs applied to the painful area in the first 48 hours helps reduce inflammation. Do this for ten to fifteen minutes every two to four hours. Be careful not to allow the ice to contact bare skin to avoid cold burns. Heat is good for spasms and stiffness. Avoid complications: Get moving as soon as the pain allows – not moving at all increases the risk of other complications such as chest infections, deep vein thromboses (DVT) and muscle wasting. Modalities including the use of ultrasound, ice, cold laser to decrease pain and inflammation of spinal structures. Painkillers are crucial in the early stages of recovery. Paracetamol is best since it has the least risk of side-effects. Anti-inflammatories (NSAIDs) have some risk of delaying healing in the first 48 to 72 hours, but should be used with caution and only with Doctor's advice. Manual Therapy: hands on care including soft tissue massage, stretching and joint mobilization by a physical therapist to improve alignment, mobility and range of motion of the thoracic spine. Use of mobilization techniques also helps to modulate pain. Therapeutic Exercises: including stretching and strengthening exercises to restore joint mobility, range of motion, and strengthen muscles of the back and abdominals to support, stabilize and decrease the stresses place on the spinal joints, discs, and neck. Neuromuscular Re-education: to improve posture, restore stability, retrain the patient in proper sleeping, sitting and body mechanics to protect the injured spine. Modalities: including the use of ultrasound, electrical stimulation, ice, cold laser, traction and others to decrease pain and inflammation of spinal structures. Home programs: including strengthening, stretching and stabilization exercises and instructions to help the person perform daily tasks and advance to the next functional level. Intercostal muscle strain usually recovers fully over the course of four to six weeks if proper physiotherapy is applied and if muscle strain is mild. Severe muscle strain on the other hand, requires longer period for a full recovery. If any of the muscles are completely torn, it may even take three to six months before the muscle has recovered enough to resume previous levels of activity.